Guess who got hit by the WordPress worm that’s been doing the rounds?! Ironically, it all kicked off as I started to work on the site in preparation for moving to a brand new format. While Integrity was doing it’s thing, checking that I’d converted a load of fully qualified links to relative ones before doing a wget archive for posterity, I started to notice a lot of bad requests for pages that really should be fine. When I hopped over to my site it was blank. Uh oh. Luckily I still had another tab with the WordPress console open from where I’d been updating a few posts, and that seemed fine. As I browsed around I noticed a few strange things though. First I noticed that I was getting some weird text in the upper right of the admin console, that later turned out to be the “Hello Dolly” plugin, which had been activated (not by me). I then noticed the most scary thing, my post count was less than I expected. Instead of 173, it was 145, where had all the rest gone? Within a minute the count was down to 133, someone/thing was deleting all my posts. I quickly killed Integrity, which stopped the deletes, and continued looking around the WordPress console. I found that all my themes bar the one I had had active were gone, and the one remaining was inactive. That’ll be why the site was blank then, there was no theme to render the site with. Having remembered that Andy Ihnatko had been hit by the worm I went to his site and gathered as much info as possible about what the problem was and how to recover from it. Luckily, I’d done an export from WordPress just the day before, so I was able to simply drop the infected database and create a clean one, download WordPress 2.8.4, install and configure from scratch, import the WXR file and copy across my unaffected images. If you’re running anything less than WordPress 2.8.4 do yourself a favour and go directly to your WordPress console / Tools / Export and get yourself an export without looking at your own site. Get a copy of your wp-content folder quick smart. Then upgrade to WordPress 2.8.4. You don’t want to waste approx 4 hours of your life to this mess, and you definitely don’t want to lose all your posts. Tomorrow (actually, that’ll be later today considering the time) I’ll be going ahead with the move to a simpler site setup I had planned and was gearing up for already. See you when the dust settles. Posted by ianmjones at 1:17 am on September 16th, 2009. 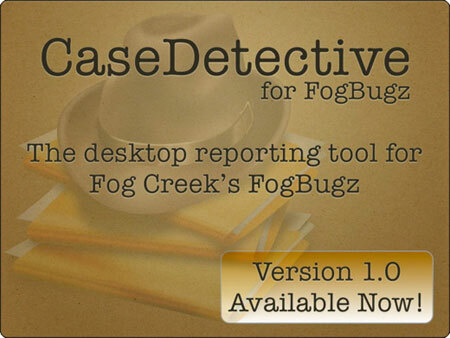 Yes, it’s true, we’re back and developing CaseDetective for FogBugz again! It must be true as the IMiJ Software and CaseDetective websites have had a bit of a face lift. There are further changes in the wings, but both sites are looking good, even if I say so my self. There’s no date for when CaseDetective 2.0 will be available just yet, but be assured development is well under way. Posted by ianmjones at 8:01 pm on October 17th, 2008. Categories: AIR/Flex/Flash, CaseDetective, FogBugz, MicroISV, Website. New tag line, simpler theme. “A developer, in so many ways”, that’s my new tag line for this here blog. Seeing as my microISV endeavor is currently on hold, I figured the old “So, now I’m an ISV…” didn’t cut it any longer, even though technically I still have one foot in the game, and have even had a very good month of sales since I put CaseDetective on hold. How weird is that? What does the new tag line mean exactly? I’m a software developer for one thing, but I’m also developing as a person in so many other ways. When I look at how Abi is developing day by day (in the last two weeks she’s gone from barely commando crawling to super fast crawling, blink and she’s gone, pulling herself up to stand against chairs and other props, and in the last couple of days she’s even taken to climbing the stairs, supervised of course) it reminds me of all the little things that I experience and learn daily that contribute to my own personal development, we never stop developing. Also, I grew tired of the heavily graphical and very Mac like theme on the ianmjones.net website, it was fairly slow to load, which irked me quite a bit. I’m now using a much nippier theme from Brian Gardener. It’s a far simpler theme, which frankly is much more my style, I like the clean uncluttered look, and although I prefer navigation etc to be on the right hand side, I’ll live with it on the left as I’m way too lazy to got to the bother of switching it as I have before. “In pursuit of simplicity”, maybe that should have been my new tag line! Posted by ianmjones at 11:42 pm on January 30th, 2008. I’ve had enough, SPAM on my company’s forum has got way out of control. Day and night SPAMers are registering new users and attempting to post to the forum, meaning I’m having to do heaps more admin than I should, banning users and deleting the odd post that gets through the Akismet filtering. Not fun. So, considering the forums haven’t really been a success anyway, I’ve stopped new user registration or any new posts. I’ve also deleted all users with no posts, which may have caught the odd genuine lurker in the cross-fire, but seeing as no one can post anymore, this can’t be much of an issue. Forums are one of those topics often discussed in the world of the microISV, as they have many pros and cons. Some of the pros being the potential for reduced support costs as common questions will be answered via a quick search of the forum, users can support each other in many cases, and a thriving community centred around your software can be a wonderful thing. But there are of course negatives, the chief of them being that if the forums are quiet it can reflect badly on your products, people can get the impression that the product isn’t doing well, whether it is or not. My forums have been very quiet, and the users of the forums haven’t really got into any kind of discussions, so there isn’t even a fledgling community there. Closing them seems like the most sensible thing to do at this moment in time. The forums are going to remain up for the time being, simply because there are a couple of links to content in them from external sources as well as my own sites. But come the release of CaseDetective 2.0 I expect I’ll be removing them. I may replace them with a FogBugz style discussion group in the future, but there’s a good chance I’ll wait until I have too many requests for forums that I can’t ignore it, and am reasonably sure they are going to be used. That may be once I have more than just CaseDetective as an offering. And yes, I’m very aware that I haven’t linked to the IMiJ Software forums from within this post, that’s totally intentional! Posted by ianmjones at 9:37 pm on August 20th, 2007. Awsome new theme for this here blog. Posted by ianmjones at 3:36 pm on July 19th, 2007. Thanks to John Gruber for pointing this out. Posted by ianmjones at 9:26 am on March 5th, 2007. Ha! I'm keeping up with the Joneses! I’ve just updated this blog to Wordpress 2.1.1, and also updated all my Mint bits and bobs to the latest versions. Well, would you expect anything less from a Jonesy! Anyway, if you do notice anything fishy about the new setup, please let me know! Posted by ianmjones at 12:50 am on February 27th, 2007. Yeah I know, not the most original of titles, but it is timely (almost)! I’m really looking forward to the coming year, primarily as it’s the make or break period for CaseDetective for FogBugz and anything else my company might produce. I’ve been away for the Christmas period visiting my family “Down South” but kept an eye on my email and forums. As expected there wasn’t much in the way of support requests for CaseDetective as most people interested in CaseDetective were enjoying Christmas too, but there was a very nice volume license sale just a couple of days before Christmas, which was very nice and timely of itself. Before releasing CaseDetective I set some sales goals that I hoped to achieve before the end of the year, in the paltry 6 weeks I had to do so. I had a “realistic goal” and an “optimistic goal”. The realistic goal was accomplished within a week of release and by the end of the year I’d more than doubled my optimistic goal. So things are looking good for this year, as long as I continue to improve CaseDetective to attract more users. As I’ve actually made a few sales I thought it a bit silly to keep my blogs tag line as “So, I want to be an ISV…”, as technically I now am an ISV, with real customers and all that. Hence I’ve changed my tag line to “So, now I’m an ISV…”. I know, sheer genius! I had been thinking about launching another product (or ten, my mind’s racing with ideas at the moment), but having the time to think about things over the last couple of weeks and the initial sales success I’ve since decided to work only on CaseDetective for the next couple of months. I was going to accomplish development of these new products by splitting up my day to allow for a couple of hours “spiking” in the afternoon, but the following post will explain how I’m now going to structure my day. Once again, Happy New Year to you all, here’s hoping we all accomplish our dreams this year! Posted by ianmjones at 3:07 pm on January 2nd, 2006. The following blogs have found there way onto my permanent feed list in the last few months, and as normal I thought I’d share them with you here. Normally I’d write a little about each one to introduce it, but frankly I haven’t got the time just now, so I’ll leave it to you to explore them and discover for yourself why I took a shine to these. All have gone into my “Business Of Software” category, but a couple could have maybe gone into “Apple” or even “Design”, but all are related to small software related businesses. Posted by ianmjones at 1:28 am on December 22nd, 2005.